A trove of Facebook ads made public by Congress depicts Russia’s extraordinary cyber intrusion into American life in 2016. The ads, seen by vast numbers of people, were aimed at upending the nation’s democratic debate and fomenting discord over such disparate issues as immigration, gun control and politics. They were released Wednesday amid two consecutive days of tough and sometimes caustic questioning by House and Senate lawmakers about why social media giants hadn’t done more to combat Russian interference on their sites. Cook spoke ahead of the Friday release of the iPhone X (pronounced “ten”). While Apple also sells ads and distributes content through Apple News, it makes most of its money from sales of iPhones. A Democrat on the House intelligence committee says Tuesday’s attack on a New York City bike path shows there is still misinformation promoted on social media platforms. Democratic Rep. Mike Quigley said If you clicked on the trending topic “New York City terrorist attack” on Twitter, the top link was from the website Infowars. That site is run by conspiracy theorist Alex Jones. Quigley said it was a “real-time example” of misinformation being weaponized. Democratic Rep. Terri Sewell says members of the Congressional Black Caucus visited Facebook’s California headquarters last month. She suggests it will be hard for the company to monitor for ads from Russia that try to stoke racial tensions if employees at the company aren’t diverse. In the U.S., 3 percent of Facebook’s workforce is black. Sewell said Wednesday the company should make sure it is not “adding to the problem,” and asked the company’s general counsel, Colin Stretch, if she should trust those vetting the ads are a diverse work force. 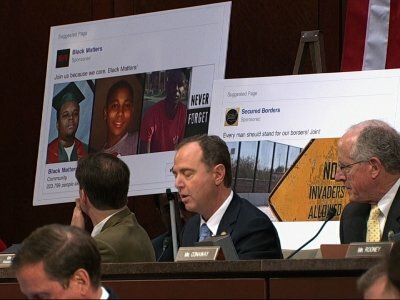 Documents released by House lawmakers show that Russian-linked organizations buying Facebook ads weren’t always successful in getting their message seen. One pro-Bernie Sanders ad from a group purportedly called the “United Muslims of America” was narrowly targeted — to those who already follow that group, as well as their friends. Consequently, the ad got just 11 views, and no one clicked it. Payment was through Qiwi, a Moscow-based payment provider. The company’s website says Qiwi aims to serve “the new generation in Russia” and former Soviet republics. The ads were released Wednesday as representatives of leading social media companies faced criticism on Capitol Hill about why they hadn’t done more to combat Russian interference on their sites and prevent foreign agents from meddling in last year’s election. Texas Rep. Mike Conaway, the Republican leading the committee’s probe into Russian interference, has said the committee will release the ads. But Conaway only released five ads on Wednesday as the panel grilled representatives from Facebook, Twitter and Google. Committee Democrats released around two dozen more. In a memo, the committee Democrats said the panel is working to “scrub personally identifiable information” so they can release the ads. Lawmakers are demanding answers from leading social media companies about why they haven’t done more to combat Russian interference on their sites. One Democrat says congressional action might be needed in response to what she calls “the start of cyberwarfare” against American democracy. Representatives from Facebook, Twitter and Google have struggled at times to defend themselves against complaints they didn’t act quickly or thoroughly enough as it became evident that Russians used the sites to try to influence the 2016 U.S. election. The top Democrat on the Senate Intelligence Committee says his questions about the interference were “blown off” by the companies until this summer.